So we have arrived at the penultimate round of the 2009 F1 season. After 15 races, I lead the championship on 104 points, 10 points clear of Jenson Button in second place and 11 points ahead of Mark Webber in third. Should I finish ahead of both of them here, I am guaranteed the title. There are a few other permutations that would see me win the title. As I have more wins (and cannot be caught on this), any scenario that leaves me still 10 points clear of Button and Webber will see me win the title as well. In practice it became clear that the track (which is one of F1’s few counter-clockwise circuits) is not as outright fast as tracks like Monza and Spa, but still has several quick sections and some truly meaty left-handers. 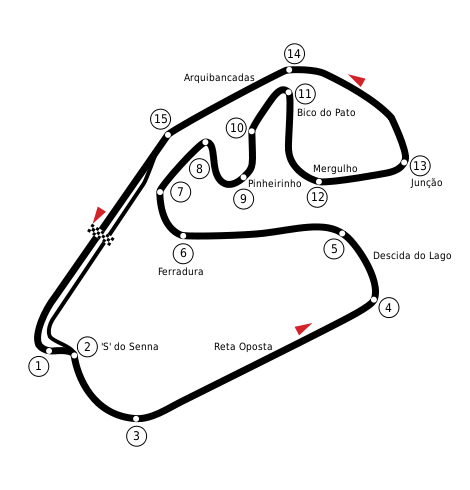 Turn 1 is a deep left-hand turn that also sees the track dip, as you accelerate into turn 2 (the first two corners together are referred to, quite touchingly, as ‘S’ do Senna) and continue to accelerate around turn 3, onto the long Reta Oposta straight. At the end of this straight is a tight left-hander that requires a generous application of the brakes, before winding through a sequence of impressive right and left corners that require further hard squeezing of the brakes. Once clear of turn 13 you then hit the fast curve onto the main straight, and then you’re gunning it hard back to the first corner. My practice run was mainly to establish the performance of the tyres. Interlagos hosts a 71-lap race, and I determined that the hard tyres could do 21 laps before needing replacing. Two stints on those would take be through to lap 42, whereupon I would don the soft tyres, splitting their runs across the remaining 29 laps. Qualifying was trickier than expected, due to rain. The track is not actually that much slower in wet conditions, but the challenge for me is, as ever, the handling of the car in wet conditions. I was ninth in Q1, and fourth in Q2, which didn’t bode well for my chances of pole. Still, after setting up the pit strategy, the final lap I put in in Q3 was, somehow, somehow, enough for pole – just barely! With the race to come, I will hopefully report next time around that I am the champion!